LOAD RITE ELITE OR 5 STARR SERIES – This is the most common question to our staff and dealers. Which boat trailer is better? It’s a matter of preference, really. Both are based on the same basic structure sharing frames and running gear. LOAD RITE 101: CHOOSING A TRAILER – How can you tell you are getting a trailer that fits your boat and your boating style? Here you’ll find answers to some of the most commonly asked questions on choosing the RITE trailer. GALVANIZED VS. ALUMINUM – Probably one of the more common questions our customers ask, and the answer’s not all that simple. Both materials are highly corrosion resistant and exhibit sufficient strength for the task. 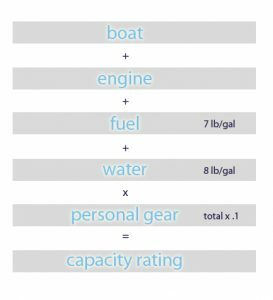 CALCULATING CAPACITY AND WHAT CAPACITY TRAILER DO I NEED – To calculate needed trailer capacity, calculate the total weight including the boat, the engine, a full fuel tank (approximately 7 lbs. per gallon), full water tanks (if applicable) and your personal gear. Load Rite Elite or 5 STARR Series? Tires – Most Elite models with torsion axles feature radial tires while 5 STARR models have bias-ply as standard equipment with radials as an option. Elite models with bias-ply tires as standard equipment are aluminum and galvanized skiff models, and models with leaf spring suspension. Lighting – Elite models feature LED lighting as standard equipment. 5 STARR Series have incandescent lighting as standard, with LED as an option. Roller systems – Elite models feature fully articulating yellow TPR roller systems. 5 STARR series have TPR rollers on steel roller bars. Aluminum bunk systems – Elite models feature AB style bunks, pivoting bunks mounted on galvanized steel support tubes. 5 STARR AC models have solid wood bunks with a beveled edge. Aluminum bunk sideguides – Elite tandem and triaxle aluminum models feature sideguide tubes as standard equipment. Elite single axle and all 5 STARR aluminum models have sideguide tubes available as optional equipment. Fender steps – Elite models feature extruded aluminum fender steps. Taillight mount – Elite models feature taillight protection integral to the mount. Elite models have taillights that are more exposed. Warranty– Although both the Elite and 5 STARR model lines feature the 2 Plus 3 Year Warranty, there are differences between the two. How to choose the RITE trailer. So many choices . . . that’s Load Rite. How can you tell you are getting a boat trailer that fits your boat and your boating style? Here you’ll find answers to some of the most commonly asked questions on choosing the RITE trailer. Can’t find an answer to your question? Send it to trailers@loadrite.com. What length boat trailer do I need? Measure along the center line of your boat from the bow-eye to transom, excluding the bow pulpit and swim platform, or “European” type transoms. See descriptive diagram here. If your boat has a bow pulpit, you may want to consider a longer tongue option. Consult your Load Rite dealer. What capacity trailer do I need? To calculate needed trailer capacity, calculate the total weight including the boat, the engine, a full fuel tank (approximately 7 lbs. per gallon), full water tanks (if applicable) and your personal gear. A good rule of thumb is to use 10% of boat, motor, and liquid weights for personal gear. Select a boat trailer with the next highest capacity rating. If you intend to carry additional gear or luggage in the boat over long distances, consider the weight of these items, too. ((boat + engine + ((fuel x 7 lb / gal)+(water x 8 lb / gal))) x (total x .1)). Click here for more information. How do I choose the right type of hull support that will meet my needs? Rollers offer the ease of quick roll-off launching and drive-on loading. Because our rollers articulate, they act as their own guide for centering your boat. Rollers are the ideal support system for those launching and loading in poor ramp or tidal conditions. However, not every boat can be towed on a boat trailer equipped with rollers. Check with your dealer or boat manufacturer to see what is recommended for your boat. Many people prefer bunk trailers where launch ramps are good, tides at a minimum, and currents and wind are not factors. Bunks provide good support for boat storage if adjusted optimally. Bunk trailers tend to require little adjustment once set for a particular boat. Traditional V-Bunks are used on our small boat trailers (up to 22 feet) and built to be submerged allowing your boat to float during launch and load. Continuous bunk models can handle much heavier loads. AB bunk models perform like V-Bunks but can support much greater weight than wood alone. With the AB system, traditional bunks are mounted atop steel support tubes and can pivot left to right, giving tremendous hull support. S.A.® Bunk Trailers are a Load Rite exclusive. S.A.® Bunks combine the smooth articulation of our roller designed trailers with the float-on characteristics of a conventional bunk trailer. Our self-adjusting bunk trailers give better support, supporting the boat with more surface area. These trailers can be adjusted to fit the boat in very little time. Load Rite recommends Quick-Slide® bunk covers on all applications where bunks would be in direct contact with a metal hull. This will prevent moisture from being trapped in bunk carpet fibers and possibly causing a corrosive environment. Do I really need brakes on my boat trailer? Brakes laws vary from province to province, but Load Rite always recommends equipping your trailer with brakes on every wheel where available. All provincal laws refer to the Gross Vehicle Weight Rating (GVWR) to determine brake requirements. The GVWR equals the combined total weight of your boat, personal gear and, of course, the trailer. Check the local brake laws with your DMV for the latest requirements, or you can find a static listing in our Service Information Center under Tow Vehicle Requirements. Load Rite highly recommends that you order your trailer with brakes on each axle. Galvanized steel or aluminum frame? Probably one of the more common questions our customers ask, and the answer’s not all that simple. First, both materials are highly corrosion resistant and exhibit sufficient strength for the task. Steel arrives raw, then is machined, bent, and drilled. Once processing is complete, it is sent to be hot dipped in a molten zinc solution that completely coats the steel inside and out and transforms it from a rust prone material to one that resists corrosion and is even self-healing. Steel is extremely strong and durable, and is ideally suited to high-stress usage such as loading of a roller trailer. The major disadvantage a galvanized boat trailer has against an aluminum boat trailer is weight. Aluminum frames are very strong, sleek, and are found to be aesthetically pleasing to many owners. Our patent-pending I-beam design with captured fasteners and integral wire gutter lends nicely to the aesthetic. Others choose aluminum over steel as a weight saving measure. Truth be told, the weight savings is not that great in many cases. Most times an aluminum structure needs to be much thicker than steel for a given capacity. You may notice that we limit aluminum framed roller models to just 6,000 lb capacity, and Load Rite recommends all aluminum framed models be limited to float-off / float-on launching and loading. What capacity boat trailer do I need? To calculate needed trailer capacity, calculate the total weight including the boat, the engine, a full fuel tank (approximately 7 lbs. per gallon), full water tanks (if applicable) and your personal gear. A good rule of thumb is to use 10% of boat, motor, and liquid weights for personal gear. Select a boat trailer with the next highest capacity rating. If you intend to carry additional gear or luggage in the boat over long distances, consider the weight of these items, too. We’ve updated most of our model listings to include three new columns of specifications. “Bow Eye to Transom Minimum”, “Bow Eye to Transom Maximum”, and “Rear to Angle Support”. This information should help our dealers better approximate how a boat will sit on a trailer. 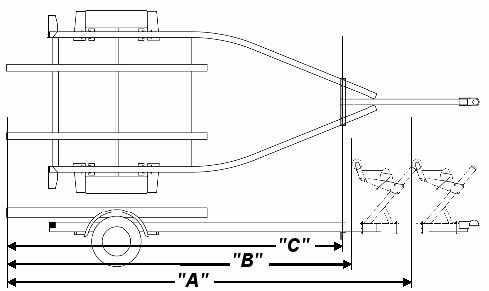 The diagrams display the correlation between the boat hull and trailer dimensions. 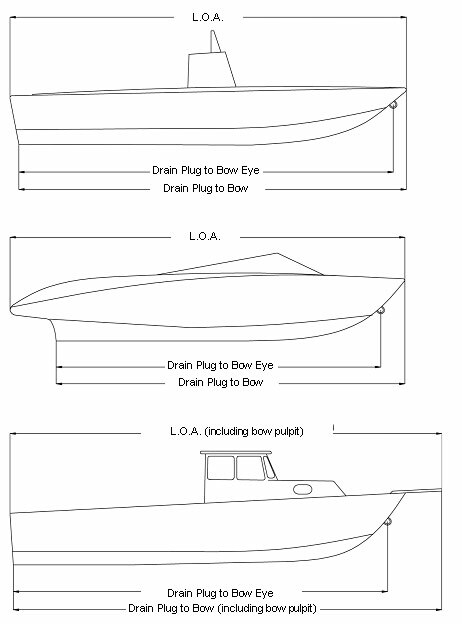 The Drain Plug to Bow Eye measurement as shown in the accompanying diagrams is the most critical in sizing a trailer for boat length. Pulpits and Euro transoms are generally not supported by the trailer. Including these in length measurements could result in a trailer that does not fit well. 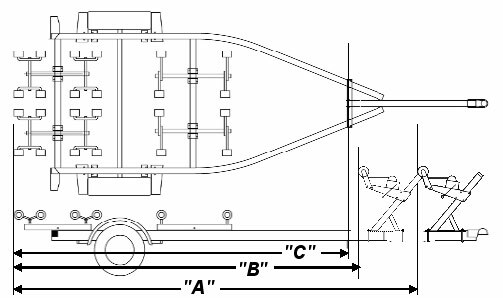 These boat trailer schematics are provided to illustrate the dimensions displayed on many of the product charts that follow. Many boat trailers have a great amount of adjustment in the support structure. Adjustment to either extreme may require moving the axles to maintain tongue weight in the 5% to 7% ideal range for most trailers. Schematics are a visual representation of a generic trailer and not drawn to a particular scale.